Adolphe Monod - Westminster Congregational Church ""
​Adolphe Monod, was beyond dispute the greatest preacher of the Protestant Church of France of the 19th century. He was born in Copenhagen in 1802 and died at Paris in 1856. He was the fourth of the twelve children of Jean Monod, pastor of the French Church at Copenhagen, and, after 1808, in Paris. As a preacher, Monod's aim was to save men from going to hell and call them to seek Jesus Christ for their salvation. 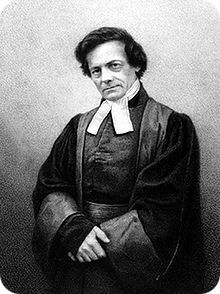 His sermons were thoroughly Biblical, and by the full exposition of the texts, and by the conviction of what he was preaching, he called the hearts of many to turn to the Lord as their Saviour. He was gifted with a full and clear melodious voice, but it was by the power of the Holy Spirit that made him such an effective preacher for the Lord. ​PDF BOOK (1.4mb) Adolphe Monod's "Farewell to His Friends and to His Church."